What's The Worst $100K+ Vehicle? Last week we wondered what the best sub-$2K vehicle is. Today we want to make this question fifty times more interesting. What's the worst $100K+ vehicle? What&apos;s The Best Sub-$2K Beater? 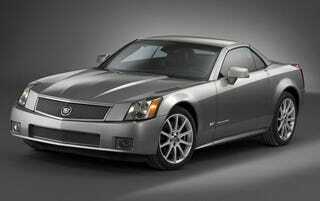 We're always amazed by the value proposition that is the Cadillac XLR-V. We've just gotten used to the concept of a Cadillac-badged Corvette with a Northstar V8 at a higher price, but we're not sure we'll ever be comfortable with the thought of paying $105,000 for the XLR-V. Sure, you get near Z06-like speed with a version of the same tweaked Northstar mill found in the STS-V, but you could also get the world-destroying Corvette ZR1 for the same price. The XLR-V may be more luxurious (ohhhhh Black Olive Ash wood appointments), but the luxury you add isn't equal to the performance you lose by not buying the better Vette.